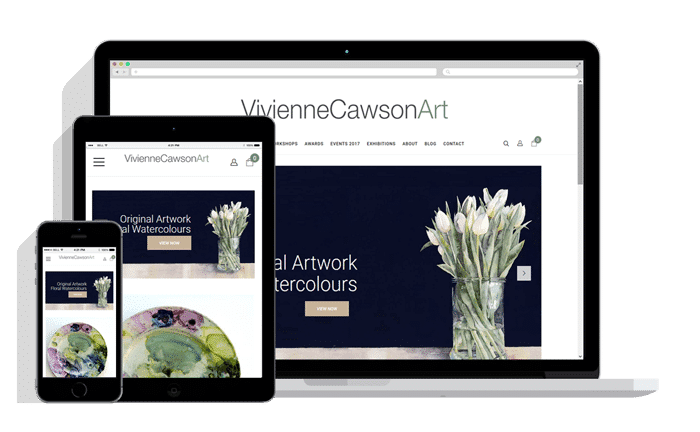 Local artist Vivienne Cawson approached DLZ Design to revamp her existing website in order to make it easier to navigate and allow direct purchases through an e-commerce system. The website needed to be minimal in appearance in order that her excellent water colours do the talking! It was an absolute must that Vivienne could edit the content and products of the website herself, as well as add to her blog. The Vivienne Cawson branding was already a good fit, and so that was utilised. A WordPress Ecommerce website was created which followed the brief of being minimal and understated with artwork at its core. The navigation and shop section of the site is easy to use and the admin allows Vivienne to update the site herself with ease. As an artist and designer, I was very clear on the look I wanted for my new website. Danny was very easy to work with, extremely patient with me as I do find the technical side quite difficult. He understood what I was looking for and took it on board, but also managed to incorporate the different pages I needed as an artist and a retailer without making it fussy and cluttered. I’m so pleased with my lovely new website which is now more user-friendly and a greatly improved site. Thank you Danny.